Archives Director Dr. Haim Gertner will present a lecture entitled "Jews Rescuing Jews: Stories from Yad Vashem's Archives"
On Thursday, 24 January 2019, Yad Vashem, the World Holocaust Remembrance Center, will host its Annual Event for the International Diplomatic Corps in Israel marking the UN-sanctioned International Day of Commemoration in Memory of the Victims of the Holocaust. Yad Vashem Chairman Avner Shalev will address ambassadors and diplomatic representatives from over 50 countries, including, Argentina, Australia, Austria, Canada, France, Germany, Great Britain, Ireland, Lithuania, Nigeria, Poland, Russia and the United States. The audience will be greeted by Israel's Minister of Education Naftali Bennett. 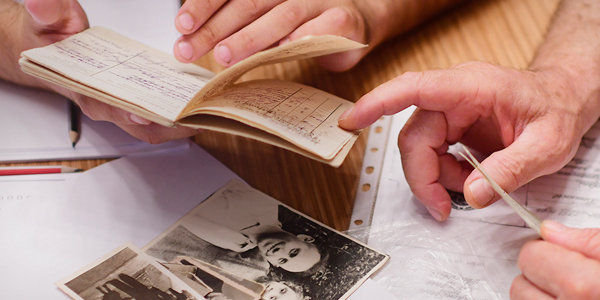 Director of the Archives and Fred Hillman Chair for Holocaust Documentation at Yad Vashem Dr. Haim Gertner will deliver a lecture on the topic "Jews Rescuing Jews: Stories from Yad Vashem's Archives." Dr. Gertner's lecture will be broadcast live via Yad Vashem's Facebook page. During the years of the Holocaust, many Jews risked their lives to rescue other Jews – family and strangers alike – even in the most difficult situations. Among the shelves of Yad Vashem's Archives, there is much information about such rescue operations. In many cases, archival documentation is the only source of information about these events. Dr. Gertner's lecture will focus on a collection of rescue stories, whose common denominator is that they relate to the wartime rescue activities of Jewish educators. Following the lecture, there will be a panel dialogue between two Holocaust survivors, Fanny Ben Ami and Haim Roet, who will discuss the phenomenon of "Jewish Rescue and Solidarity in a Disintegrating World." The event will take place in the Constantiner Lecture Hall, located in Yad Vashem's International School for Holocaust Studies on the Mount of Remembrance in Jerusalem. Media interested in covering this event should contact Simmy Allen and arrive at Yad Vashem by 16:00. Also marking International Holocaust Remembrance Day, Yad Vashem traveling exhibitions will be on display around the world, including in the United States, Latin America and Europe. The "Beyond Duty" exhibition, prepared by Yad Vashem for Israel's Ministry of Foreign Affairs, will be on display in the General Assembly of the United Nations. In addition, Holocaust scholars and educators from Yad Vashem will participate in various events and ceremonies worldwide. A mini-site marking International Holocaust Remembrance Day, featuring a variety of resources the public can view, share and engage in, online exhibitions, and educational resources has been uploaded to Yad Vashem's website. The site dedicates a complete section of informative resources about the liberation of Auschwitz-Birkenau, which took place 27 January 1945, and is the reason this specific date was chosen by the UN to commemorate the Holocaust and its victims worldwide.